Posted: July 27, 2018 in Obscurities, Who,What,Where & When...? 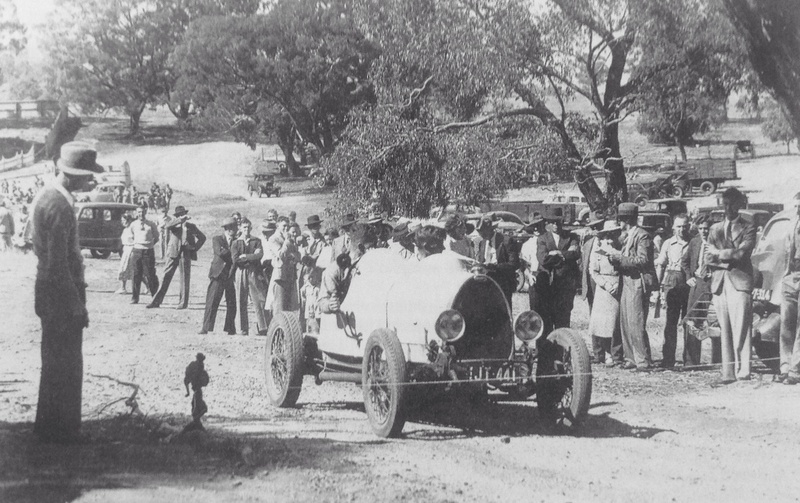 The shot is from the archive of the State Library of Victoria, it was taken by George Thomas who was a prolific ‘snapper at motorsport events throughout Victoria at the time. Ballarat, 120 kilometres west of Melbourne is a ‘Gold Rush’ town. Over 600,000 people came to Australia from all over the globe in the 1850’s to chase their fortune with Ballarat one of the main destinations of the optimistic. It’s a beautiful place with many of the stately buildings of the period still standing- including the George Hotel. The interesting thing of course is which particular chassis it is and who the fellows are. My recently acquired copy of ‘Bugattis In Australasia’ (details in credits below) personally delivered by the very knowledgable, youthful, spritely 81 year old author Bob King suggests it is either Bill Fleming or Neil Barter assuming the photo date range is accurate. The car is a long-chassis ‘Modifie’, without going into all of King’s detail, the chassis number of the car cannot be positively confirmed but it came from New South Wales to Victoria in 1938 when owned by Fred Betts who never registered it but raced it at Phillip Island pre-war. 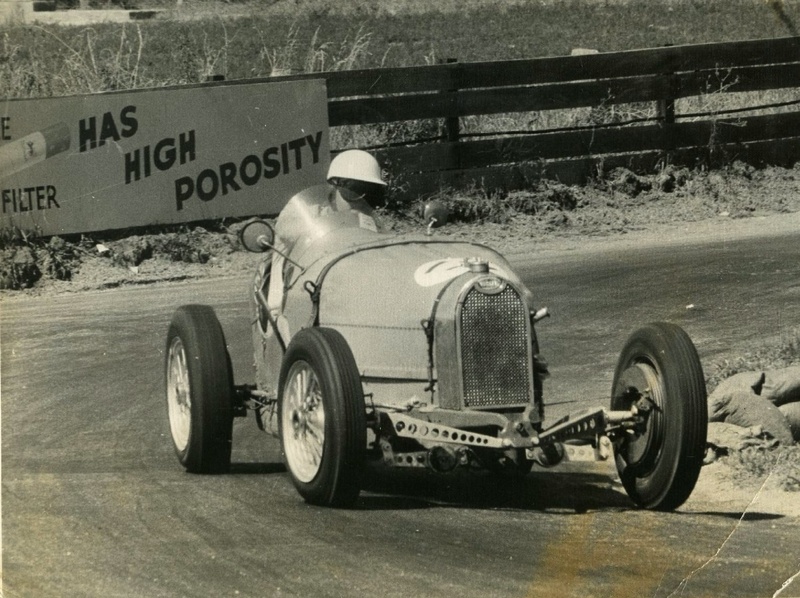 After the conflict it was raced by John ‘Bill’ Fleming at Hurstbridge and Rob Roy Hillclimbs in Victoria in 1948 before being sold to Barter that October. At this stage, as shown in the opening photograph, the car was registered in Victoria ‘JT441’ and was fitted with engine number ‘2566’. Barter recounts in King’s book ‘By January we were driving it around as much as petrol rationing would allow. 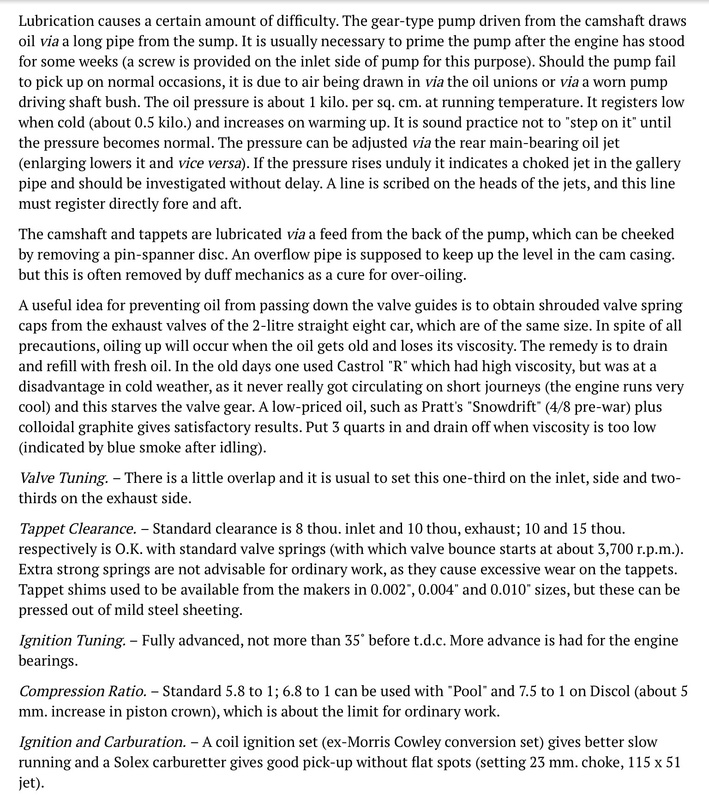 After correcting a dismally retarded camshaft timing, we found the performance astonishing- 40 mph first gear, 60 in second, 4300 rpm etc- we were never short of superlatives. Alas youthful exuberance led to disaster and injury when…April 1939…the car overturned at the corner of Dendy Street and The Esplanade, Brighton’ a bayside Melbourne suburb not too far from Albert Park Lake, a place all you global GP fans will be familiar with. ‘A regular trick was to drive it as quickly as you could along Beach Road at Brighton Beach and, instead of taking the right hand corner…we would hurl it into the gravel car park opposite the monument, put it into a 180 degree slide and then drive straight out again, heading back towards Hampton. The prize for the night went to the driver who travelled the quickest and made the cleanest 180 degree slide!’ What a great thing to do after a few bevvies on a Friday or Saturday night?! ‘This all came to a halt when, one night, with four up, I rolled it when turning from the beach road into Dendy Street…a very sobering experience for all and particularly me’ Neil Barter wrote. Looking at the young blokes in the car at Ballarat my guess is that it’s Barter and one of his ‘Brighton Grand Prix’ accomplices! Bob King records a bewildering nineteen owners of this car, the last, Wolf Zeuner in the United Kingdom whilst noting the book’s publication date of 1992. 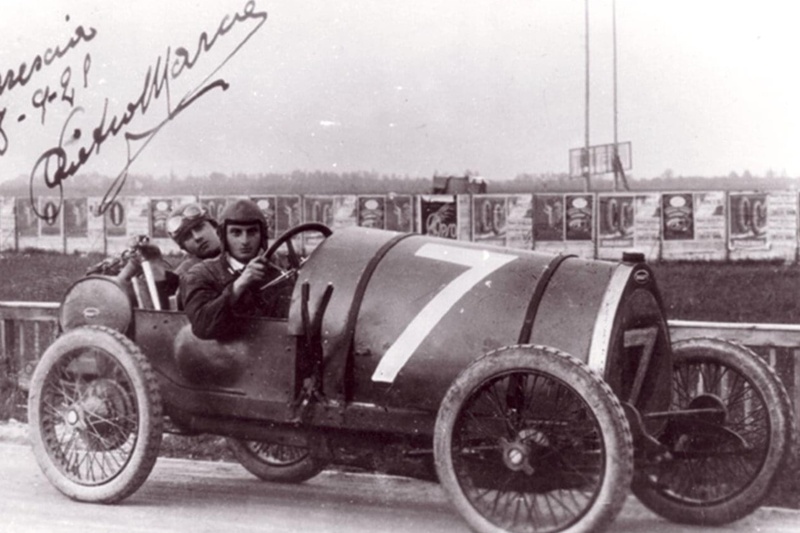 The name ‘Brescia’ was applied to these cars (T13 2 metre chassis, T22 2.4 metre, T23 2.55 metre) after the cars placed first to fourth in the 1921 Italian Voiturette Grand Prix. 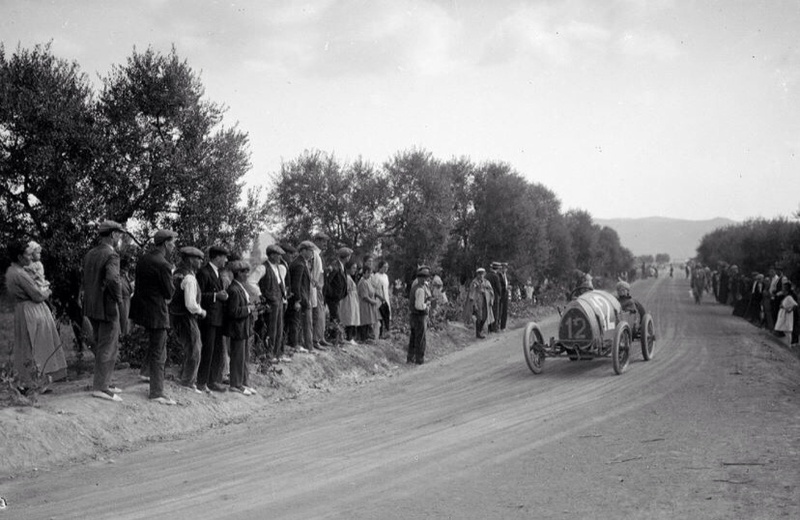 This event, the ‘1 Gran Premio delle Vetturette’, held on 8 September 1921 on the Circuito di Brescia involved 20 laps of a 17 km course, a total of 346 km. Thirteen cars contested the race, the winning Bugatti T22 of Ernest Friderich completed the distance in 2 hours 59 minutes 18.6 seconds. He was followed home by teammates Pierre de Vizcaya, Michele Baccoli and Piero Marco all in Bugatti 22’s, they were chased home by a group of four OM465’s. Manufactured from 1919 to 1926, 2000 Brescias were built, more than any other type of Bugatti. 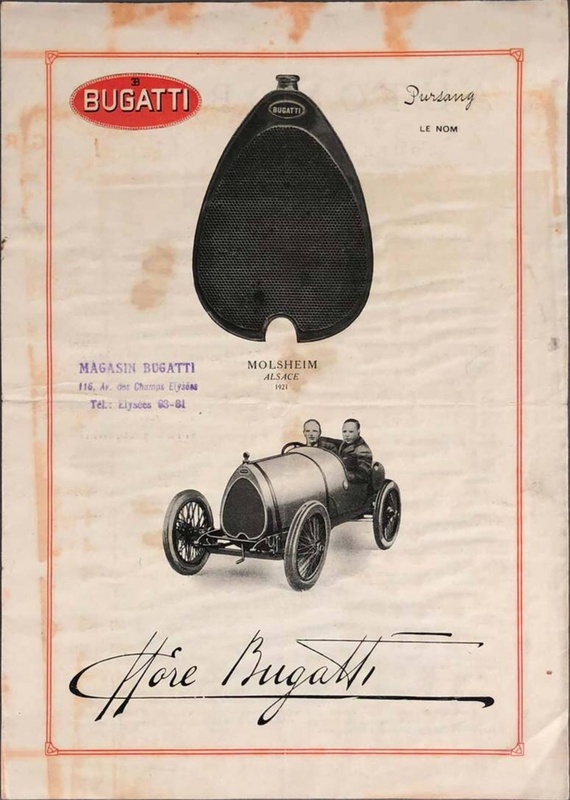 ‘Being the first Bugatti made in any numbers, it was the Bescia that established Bugatti’s reputation as a builder of sports and racing cars. They were imported into Australia and New Zealand in considerable numbers…’ King wrote. In the early twenties Bugatti didn’t build the bodies of their cars with the exception of minimalist T13 racing coachwork, so all of the new cars imported to Australia via the London agent, Sorel, were shipped in most cases in bare chassis form. A tax or tariff was imposed on imported coachwork to help stimulate the local industry with ‘Many of the local bodies fitted to Brescias appear to have been of poor quality. This, coupled with the harsh ride of the Brescia and the poor roads on which they were driven, ensured that the coach work had a short life. 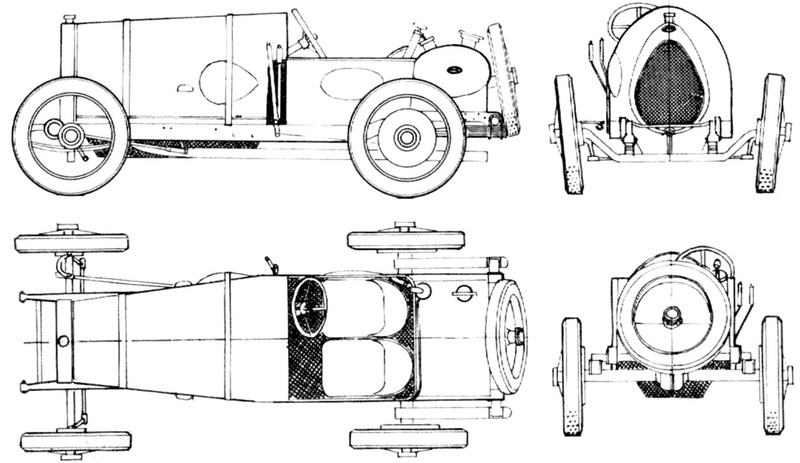 With the need for light bodies for competition work, the discarded original bodywork was usually followed by a succession of amateur built bodies.’ King wrote. 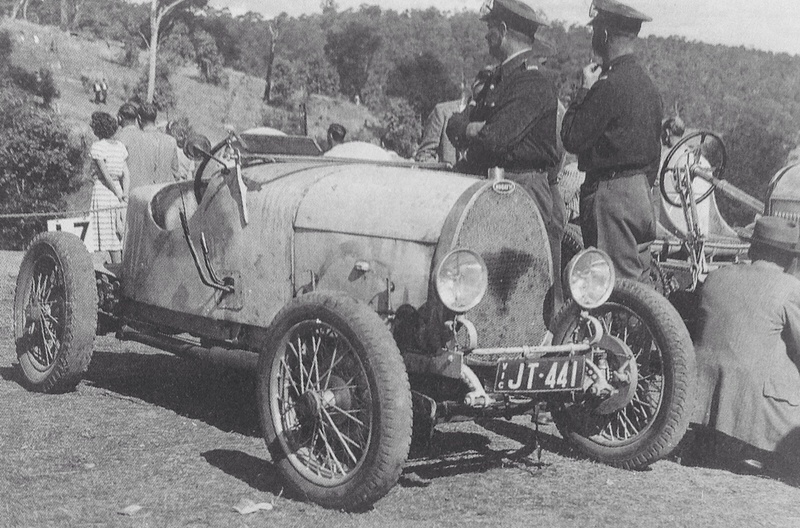 Bugatti played a very important part in the formative years of Australian motor racing as the weapon of choice for many sportsmen on road circuits, hillclimbs, the concrete saucer at Maroubra, gravel speedways and the beaches of Gerringong and the like. 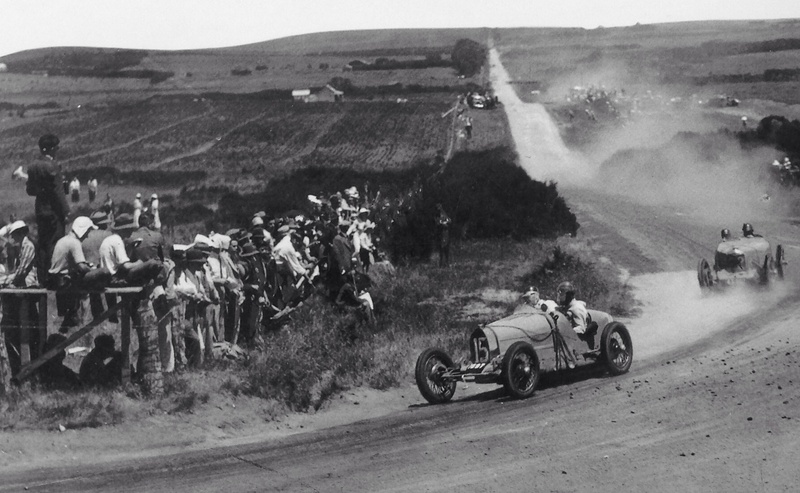 A straight-8 Bugatti T30 driven by Geoff Meredith won what is now acknowledged as the first Australian Grand Prix at Goulburn, New South Wales in 1927-Goulburn, 200 km south of Sydney was also a Gold Rush town. In fact Bugatti won five of the first six AGP’s creating huge brand awareness by the standards of the time. 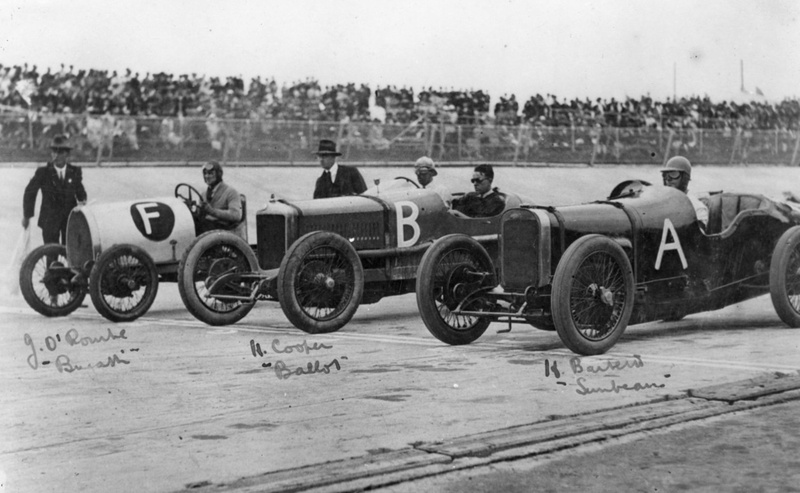 Four cylinder Bugatti T37A’s, the supercharged variant of the T37 were victorious in the Phillip Island AGP’s of 1929- Arthur Terdich the driver and in 1930 and 1932 when driven by the ace of the period, the great Bill Thompson. Carl Junker won in 1937 in a straight-8 1.5 litre T39. The Phillip Island AGP’s were handicap events so there is no reason a Brescia could not have won a race with the right mix of speed, reliability and luck from the handicapper but such was not ever the case. The best Brescia results in our premier event were Merton Wreford’s fourth in 1932 and John Bernadou’s fifth in 1929. Mert raced chassis ‘2133’ ex-Arthur Terdich and ‘In practice Wreford’s straight line speed was bettered by very few cars and he was actually faster than Drake-Richmond’s Type 37. 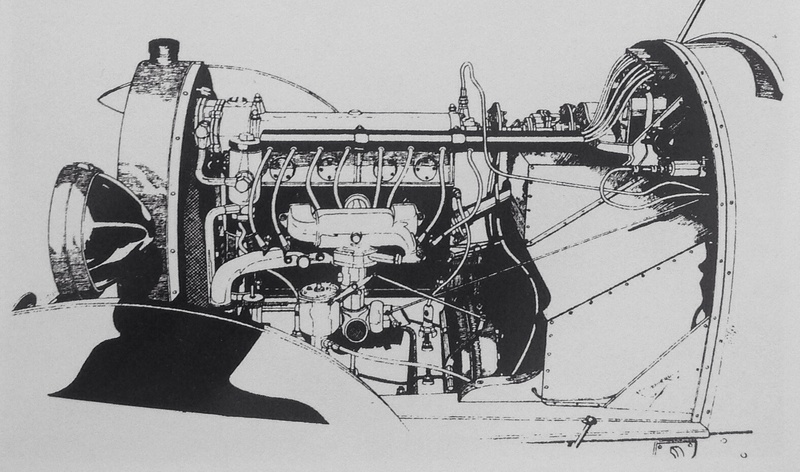 In the race Mert was given a 15 minute start by the blown Type 37A’s of Terdich and Thompson and he finished a creditable fourth place on handicap, averaging almost 65 mph for the 200 miles with his old two-wheel brake Brescia in spite of losing four valuable minutes with clutch trouble’ Bob King wrote. John Bernadou raced his father Albert’s ‘2536’ in the 1929 AGP, with both father and son competing extensively in Victoria in the mid-twenties, despite being delayed by a hole in the cars fuel tank John was third in the Under 1500 cc class and fifth overall. 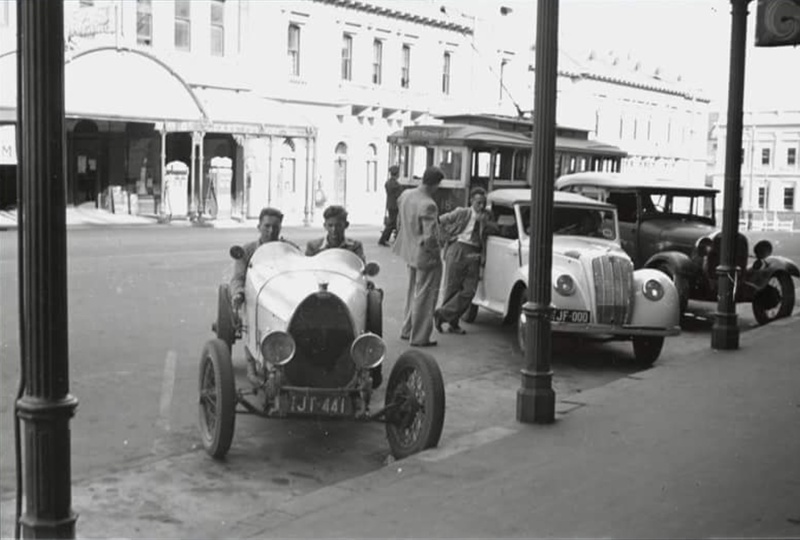 Some (not a huge number mind you) quite exotic racing cars came to Australia pre-War including several Vittorio Jano designed Alfa’s but the faster Bugatti racing straight-8 T35 and T51’s didn’t make the trip until post-War, when they were of course beyond the first flush of youth. 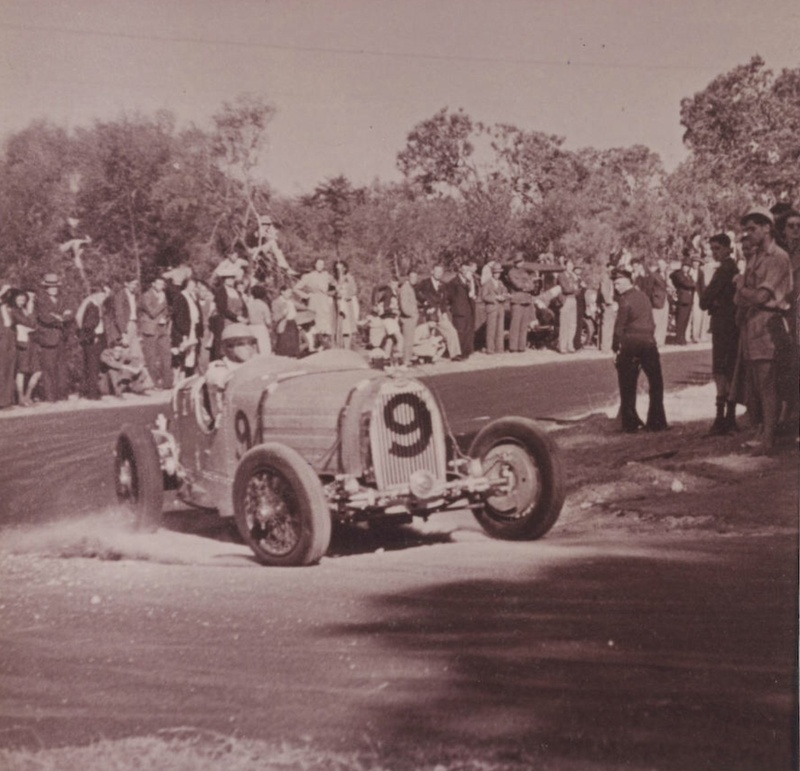 In our racing, which comprised many events run to handicaps the cars were competitive but none won a post-War AGP- all played an important role in bolstering grid sizes throughout the long ‘Era of The Australian Special’ which in the main were often MG based or Ford side-valve V8 powered. 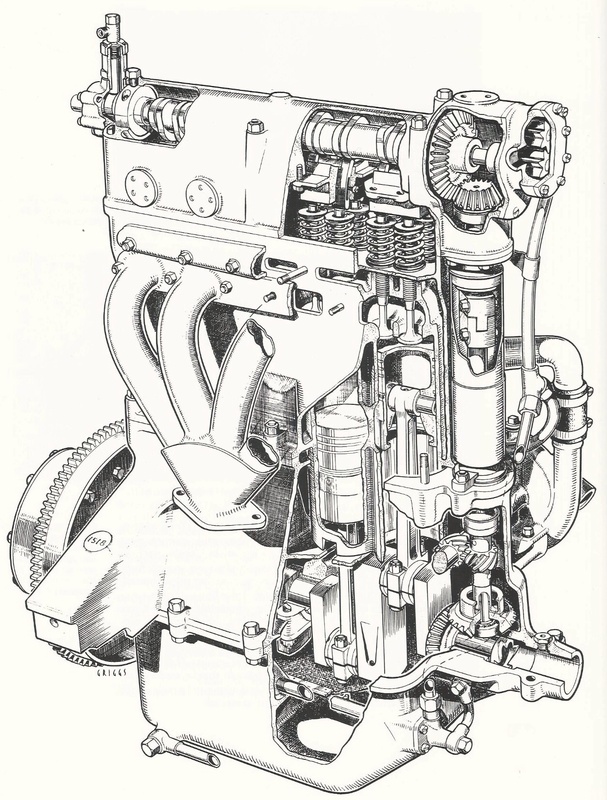 In many cases once the original Bugatti (or Alfa or Ferrari or Bristol) motor ‘blew’ Ford V8’s or a bit later a small block Chev or Holden ‘Grey’ six-cylinder engine was inserted under said car’s shapely aluminium bonnets. 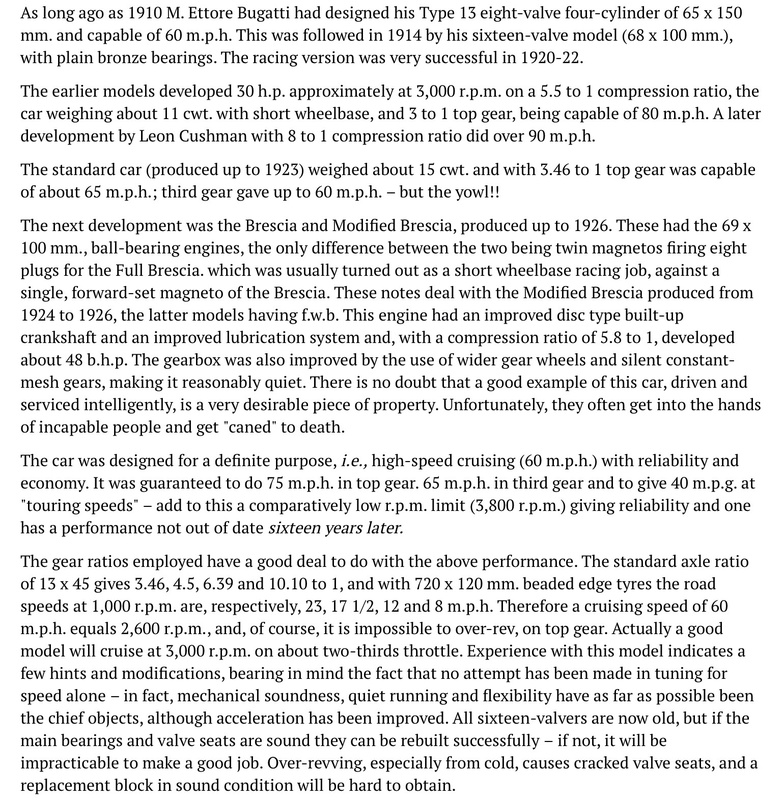 To reframe my shallow comment a moment ago about ‘Australian Specials’ the wonderful breed included ‘tool room quality’ machines such as the Charlie Dean/Repco Research built Maybachs, the Lou Abrahams/Ted Gray Tornados and Chamberlain brothers Chamberlain 8- ‘outrageous in brilliant original conception’ cars such as, again, the Chamberlain 8 and two of Eldred Norman’s masterpieces, the ‘Double 8’ and Eclipse/Zephyr Spl and ‘the rest’ which includes anything and everything from mild to wild MG’s and Ford V8 engine specials not to forget the Hudson straight-8 engined machines pre-War. The ‘high point’ of those is, perhaps, the still extant (Frank) Kleinig Spl- MG chassis, monoposto, Hudson-8 and much, much more. There was no lack of creativity amongst this countries mechanics and engineers however basic the underpinnings of the machines they started with! 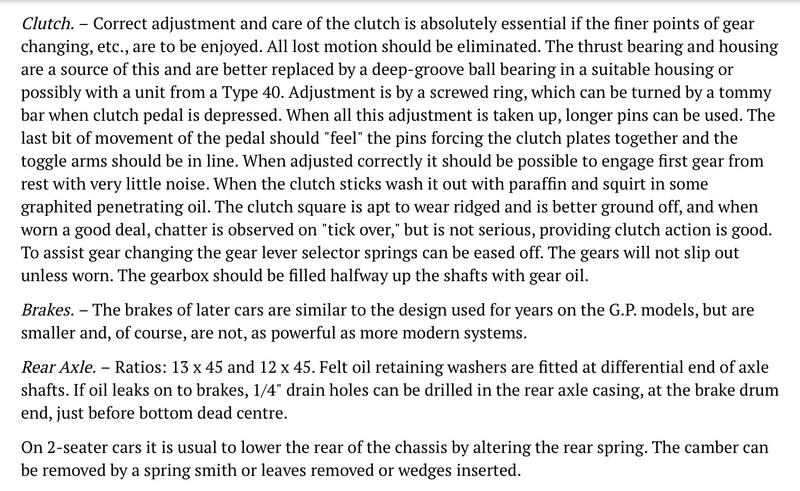 A ‘game changer’ was the move in AGP regulations from handicap to outright events from the 1949, Leyburn Queensland AGP which was won by John Crouch’s Delahaye 135S. Mind you that did not stop the organisers of the 1950 Lobethal South Australia and 1951 Narrogin, West Australia AGP having an each way bet placing as much emphasis on the handicap winner as the outright or scratch winner, something which comes through very strongly in the contemporary newspaper accounts of the day. 1951 was the last ‘handicap AGP’ (in part) and the last won by an Australian built car (the Warwick Pratley driven George Reed built, Ford V8 engined George Reed Special) until Frank Matich won the 1971 AGP at Warwick Farm a couple of decades later in his several days old F5000 Matich A50 Repco Holden. From then on those who wanted to win the race needed to have the readies to acquire a car with the speed, endurance on our rough road circuits and reliability to do so. The balance of the fifties started the ‘Factory Car Era’- a Talbot Lago T26C won in 1952/3 (Doug Whiteford), HWM Jaguar in 1954 (Lex Davison), Ferrari 500/625 won in 1957/8 (Davison), mid-engined Cooper T40 Bristol in 1955 (Brabham) and Maserati 250F’s in 1956/9 (Moss/Stan Jones). 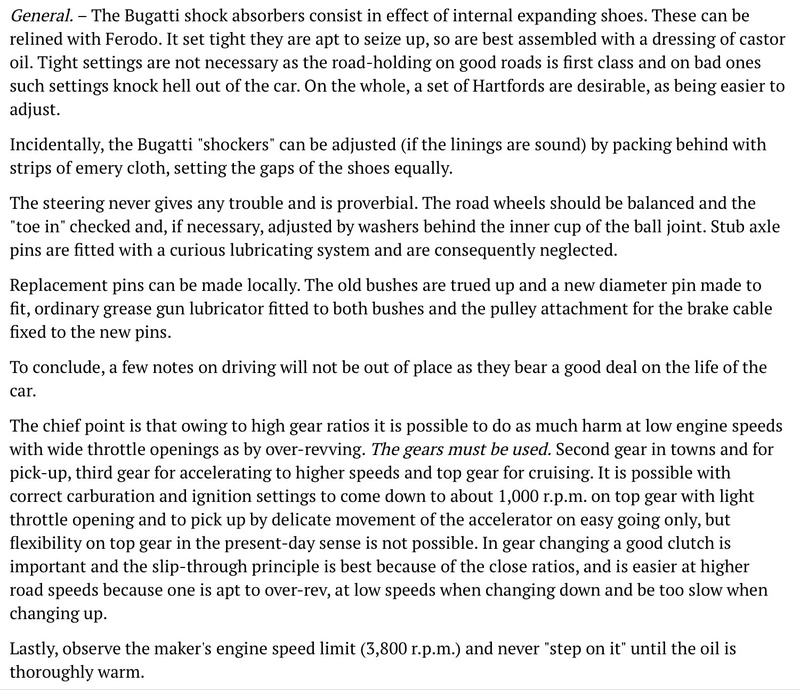 In amongst all of this the pre-War Bugatti’s whether Bugatti or ‘black iron’ powered still played an important role. 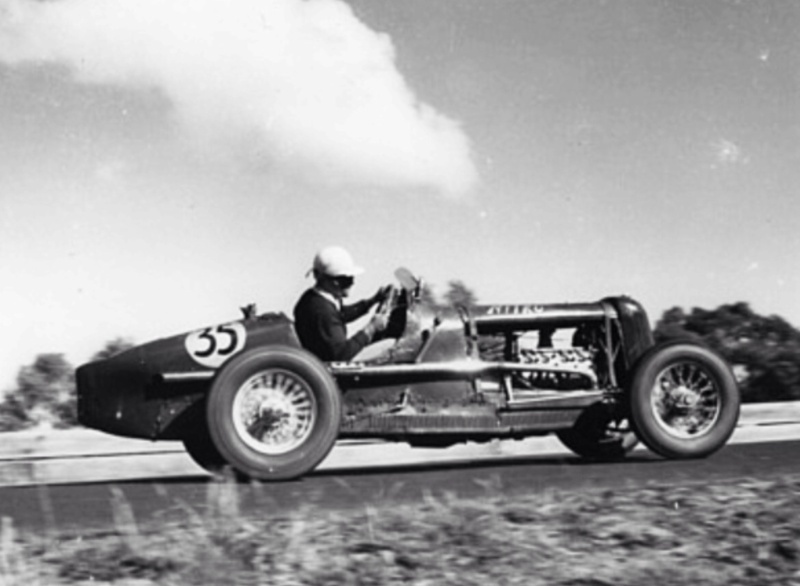 The last AGP grid of ‘substantial’ Bugatti numbers was the 1952 Mount Panorama contest in which three entered- the Bill McLachlan T37A Ford V8 finished 13th whilst the T35B/51 shared by Phil Catlin and Peter Menere was 15th, the P Lowe T37 Holden failed to finish. In fact the placings by McLachlan and Catlin/Menere were the last in an AGP for Bugattis- albeit one was Ford V8 powered, the other with a motor from Molsheim. For the record the very last start by a Bugatti in an AGP was the David Van Dal/John Cummins T57 which failed to finish the 1957 Caversham race won by Davison’s ex-Ascari Ferrari 500/625- and there ended a very rich contribution by the marque to Australian motor racing which commenced with substantial numbers of Brescias and Geoff Meredith’s first AGP win aboard his T30 at Goulburn in 1927, thirty years from start to finish! Been putting my new book to work Andrew! Instant authority with lots of help from Bob King!